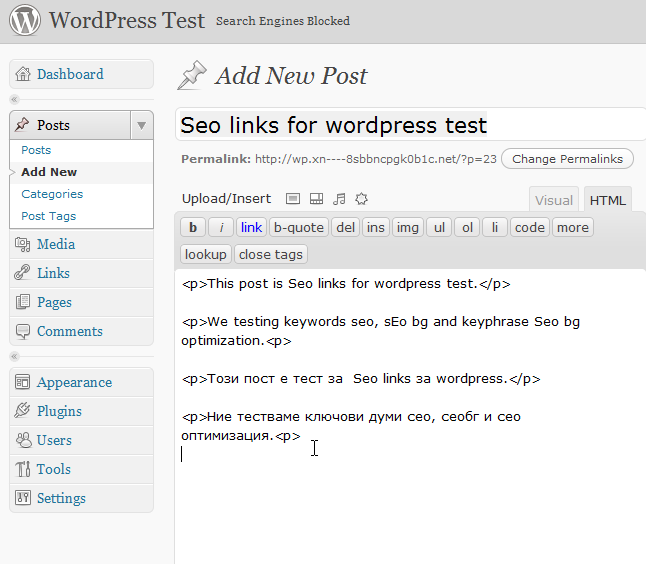 Seo Links for Wordpress is a plugin for WordPress which automatically converts key phrases in posts into links. This plugin is similar to Seo links pro for Joomla that work unproblematic from one year at over TWO thousands websites. The main advantage of our plugin is that it supports long tail key words as well as Cyrillic and any other UTF-8 charset. 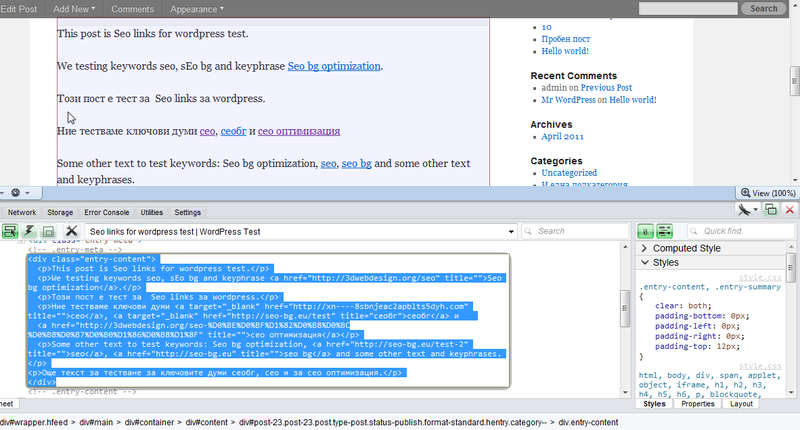 Tests show that there is no better plugin for OnPage Seo Optimization for Wordpress blogs at this moment. If these keyphrases are configured to link to different links all of this will work unproblematic. You will able to easily publish links using possibly a large number of long tail key phrases. You can forget about the manual publication of links in Wordpress now. Seo Links for WordPress has all the options Seo Links Pro for Joomla can offer plus a new key phrase parameter - the key phrase's posts frequency: N. What it means is: "Parse every N posts for the given key phrase". 1. Word - a key word or phrase. SEO Links is looking for the phrase in the post and makes it a link if found. Key phrases in Cyrillic are case sensitive! This means that for a given keyword "мебел", for example, "МЕБЕЛ" or "Мебел" will NOT be converted into links. 2. URL - The URL address of the link, into which the key phrase will be converted if found. May contain Cyrillic and other UTF-8 characters. 3. Title - The title of the link. Most browsers display this text as a tip when the link is pointed over with the mouse. 6. Posts frequency - Specifies one in how many posts is to be parsed for the presence of the key phrase. The plugin checks if the ratio of the post's ID and the Posts frequency is an integer. If yes - the post is parsed for the presence of the key phrase. Posts frequency = 1 means "check every post". Posts frequency = N means "check every N-th post (each post with ID divisible by N). 7. Occurrence - At which position in the post the key phrase transformations should occur. 8. Limit - The maximum number of key phrase transformations per post. This plugin for wordpress does not support: By default keywords in heading tags (h1-h7) are not converted to links but this can be switched off by editing of regular expression in code of plugin. Note that plugin search between words in content for exact match, if some of keywords is inside html tag and is surrounded with html tags replacement also will be working. Plugin is Open Source, but commercial. All rights are reserved for 3D Web Design. You can use plugin at so many blogs as you can. Price of Seo Links For Wordpress is $9 (changed on 15.10.2014, before: 19 USD). Want to test before buy? 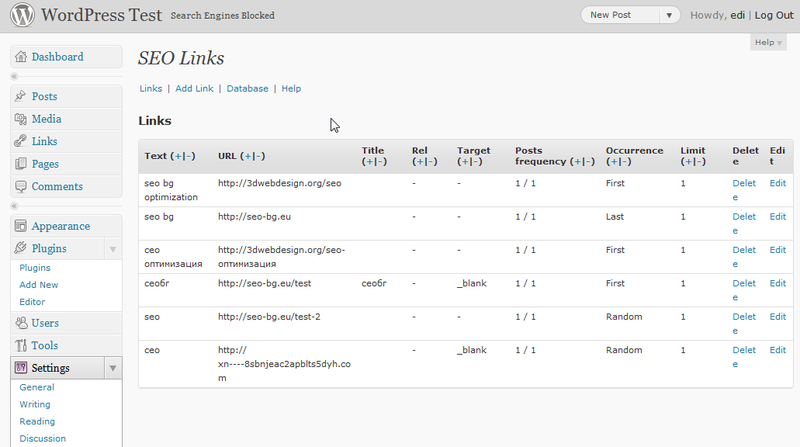 Free download For PHP versions to 5.4: Seo Links Pro for Wordpress Trial. Plugin is published, sales are started. I make order right now, please, say me where is download link? After purchase plugin is automatically sent to your email also. I mean email that you have write in order. If you have trubles with download, please PM me or sent us email and i will send you plugin at your email. I install plugin, work perfect. Great job! But i have one more question: In your example at this picture i see url addresses that are with characters different than latin. -> search engines will follow the link. Keyword inside html tag and replacement of keyword when is surrounded with html tags now work. Installed on my blog network - about 230-240 blogs. Plugin work perfect and results of internal long term links are imperssive. Some update or new version? There is no newer version - v.1.1 is latest. Google has become smarter and we must to beat him again. 1. Now plugin support keywords to random links replacement. You can configure to ten different links and in every post keyword will be replaced with one of these to ten different urls. 2. 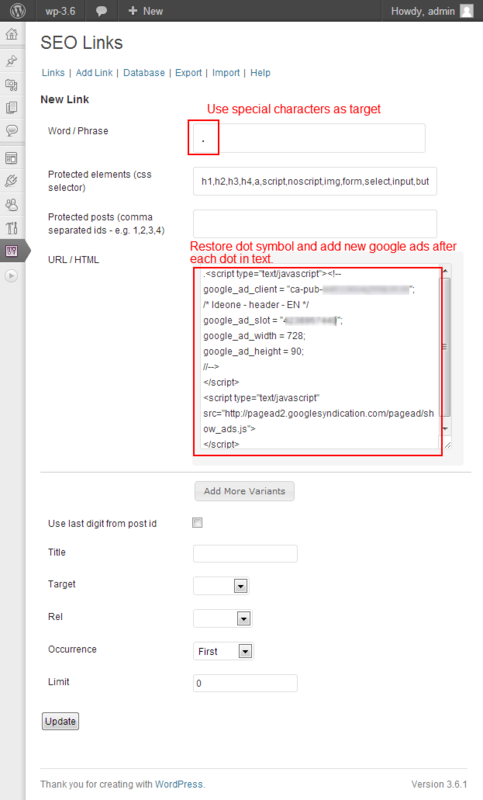 Plugin support ordered keywords to links replacement. You can configure that keyword be replaced in posts with latest number of id's 1 with url 1, in posts with latest number of id's 2 with url 2 and so. 3. Now plugin support keywords to random html code replacement. You can configure to ten different html code snippets and in every post keyword will be replaced with one of these to ten different html codes. Update is not uploaded yet! Update - v.2.2. is uploaded, we find bug and fix them. 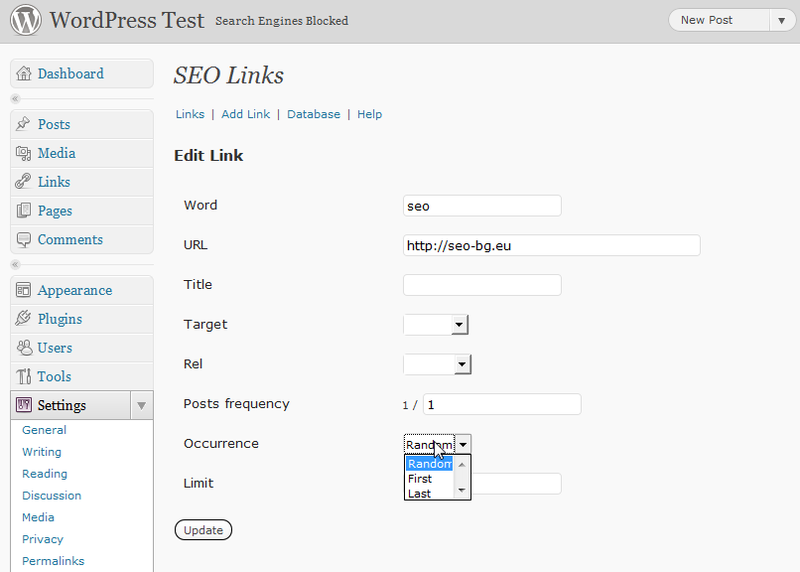 New v.2.3 of Seo Links Pro for Wordpress is released today, 06.11.2012. - Fixed is bug in Opera browser in admin. - Added are options to have ordered links or random links in keyword confuguration. If you will post ads, you can have also ordered ads (in every post one particular ad) or random ads (in every post different ad every time). 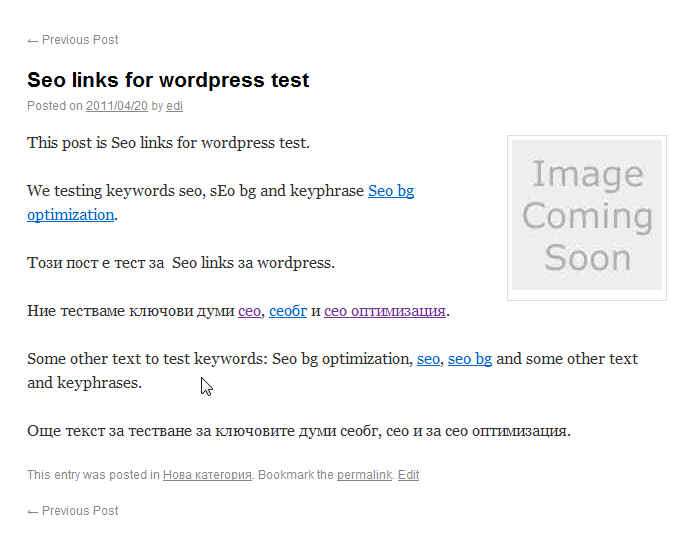 Today seolinks for wordpress plugin is updated to v.2.4.1. Soon will be available trial version for free download to test this seo plugin. You can download and try for free latest Seo LInks Pro version for Wordpress from here: Seo Links Pro for Wordpress Trial. Trial is not limited in time! 23.07.2013: New version - v.2.4.1-b2013 is released. Are cleared some small bugs with non-standart html special chars in blog posts. 2013-10-03: New version - v.2.4.2-b2013 is released. 2. New functionality is added. Now is posible to target only special characters(single or many). They are automatically detected. This option will be very usefull for example if you need to transform all dots or commas in text to ads. You can use combination of symbols like ., or ;. etc. This function is perfect to configure point and comma's with google adsense code - you will get random adsense ads in all site with single keyword configuration. How to get random adsense ads in all Wordpress with only 3-4 clicks? 3. Add at least 3-4 different adsense code types. 4. Select "Limit" - 2 - this will insert to two adsense code snippets on page. SeoLinks plugin is updated again. Latest version is v.2.4.4. 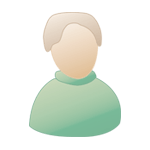 Changes: compatibility changes for latest php versions - Php 5.5 and Php 5.6.